On the 3rd of July 2017 an introductory evening was held for a remarkable Amsterdam initiative. 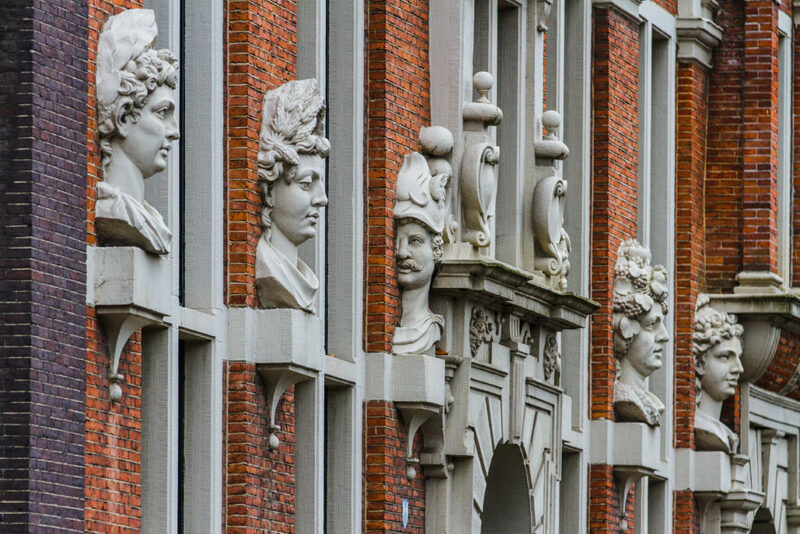 The legendary Huis met de Hoofden (House with the Heads, Keizersgracht 123) was rededicated to a new function, as the home of the Ritman Library, the Bibliotheca Philosophica Hermetica. The library is the foremost privately founded research center for study of the hermetic and other esoteric traditions in Europe. It was built by Joost and Rachel Ritman over long decades, and has now been donated by them to a cultural non-profit foundation housed in the new quarters. They and their daughter Esther, chairman of the foundation and director of the library, call the House with the Heads an Embassy of the Free Mind (Ambassade van de Vrije Geest). When the Ritmans asked me whether I was willing to serve as an Ambassador of the Free Mind, I said yes without hesitation. The following is a slightly amplified English translation of the talk that I gave on 3 July. When I want to ease my mind, it isn’t honor that I seek but freedom. Als ik myn geest uitspanninge wil geven, dan is het niet eer die ik zoek, maar vryheit. This policy statement by Rembrandt was committed to writing by his biographer Arnold Houbraken. What could be a more appropriate text for an address by a Rembrandt lover at the Embassy of the Free Mind than a line in which Rembrandt speaks in one breath of the mind and freedom? It is also a thankful text because it calls for commentary. Rembrandt’s words are not all that self-explanatory. They create an opposition and lay down a challenge. They reflect the attitude of someone who rows against the stream. That too makes the statement appropriate as a motto for this House. Freedom is never delivered free of charge at your doorstep. Rembrandt’s choice came at a price. It cost him the understanding of many of his patrons, buyers and colleagues. To start with – what’s wrong with honor? Honor is a good thing for an artist, isn’t it? 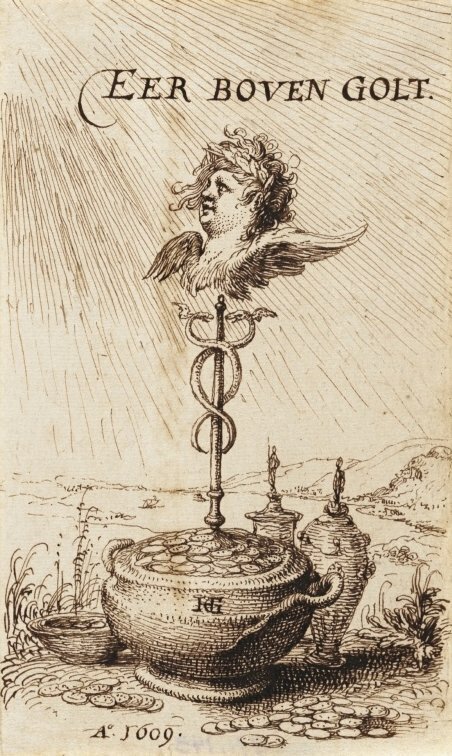 The motto of the phenomenal Haarlem engraver and painter Hendrick Goltzius was repeated proudly by every self-respecting Dutch artist: “Eer boven golt” – Honor above gold. Even artists who did not live by this principle – especially them – liked to be praised for such a superior attitude. And here comes Rembrandt implying that honor is not the highest aim to which an artist can aspire. This is not only his loss. Honor is something accorded by others. By choosing for freedom above honor, Rembrandt robs those patrons, buyers and colleagues of a source of their own self-esteem. What was it, anyway, that freedom of his, that was worth more than honor? In daily life, it meant nothing more than that Rembrandt preferred drinking a beer with his buddies in a tavern to paying courtesy visits to wealthy patrons in their town palaces. That was bad enough. An ambitious artist was dependent for his living on those town palace dwellers, a dependency that entailed the gracious acceptance of social obligations. He persisted in his own way of doing things and did not shrink from sinning against our rules of art – against the anatomy and proportions of the human body, against perspective and the use of antique statues, against Raphael’s drawings and ingenious compositions, and against the academies that are so highly necessary for our profession, arguing that one should work exclusively from nature and observe no other rules. This judgment is based on the age-old philosophical distinction between the ideal and the real. An artist who strove to create ideal forms (this was thought of Raphael) will regard individual humans and other creatures as deficient derivatives of a perfect ideal, a Platonic idea. The ancient statues to which Sandrart refers compensated for this inconvenient truth, it is said, by such means as combining the best features of five different women into one perfect specimen. Critics who accused Rembrandt – and invariably Caravaggio as well – of following nature and nature alone placed these artists in the camp of the “realists” who denied the existence of “ideas.” In theoretical writings the champions of the idea almost always carry the day. They had the institutions on their side, the academies that Sandrart considers so indispensable. He himself founded an academy and gave his monumental book the title Teutsche Akademie. (See the exemplary annotated online edition.) By combating academic prescripts, Rembrandt brought down two hundred years of derision on his head. Not until the mid-nineteenth century, when artists began to rebel against the academies and embrace “realism” as a doctrine, was Rembrandt mounted on the pedestal on which he still stands. This brings us to a sensitive question: may Rembrandt’s critics have been right? Did Rembrandt really draw, etch and paint from nature and nature alone? I do not believe it for a minute. Neither did Rembrandt’s admirer Constantijn Huygens. Writing about the figure of Judas in Rembrandt’s painting Judas returning the thirty silver coins to the priests in the Temple, Huygens praises Rembrandt for “combining in a single figure such a variety of specific features, while expressing so many universal principles.” Huygens was more aware than Sandrart or Houbraken that Rembrandt married observation to conception, the real to the ideal. What Rembrandt was after, as I see it, was not so much nature as truth. Of course that demanded accurate perception and correct representation of the visible world. But that was not all. Truth was not totally contained within the confines of physical reality or natural phenomena. 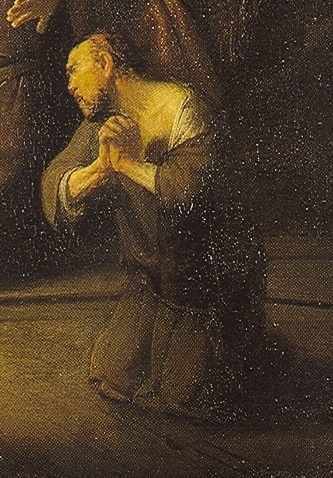 Rembrandt’s inner vision and convictions also found expression in his art. Like nearly all his contemporaries, Rembrandt believed in a supernatural realm, in a God more real than sensory impressions. But you do not have to be a man of the seventeenth century or believe in God to acknowledge that the door between perception and reflection not only separates those realms – it also joins them. Rembrandt was not the only Amsterdamer of his time to seek truth in the union of apparent opposites, nor was he the only one to pay a high price for pursuing that truth. 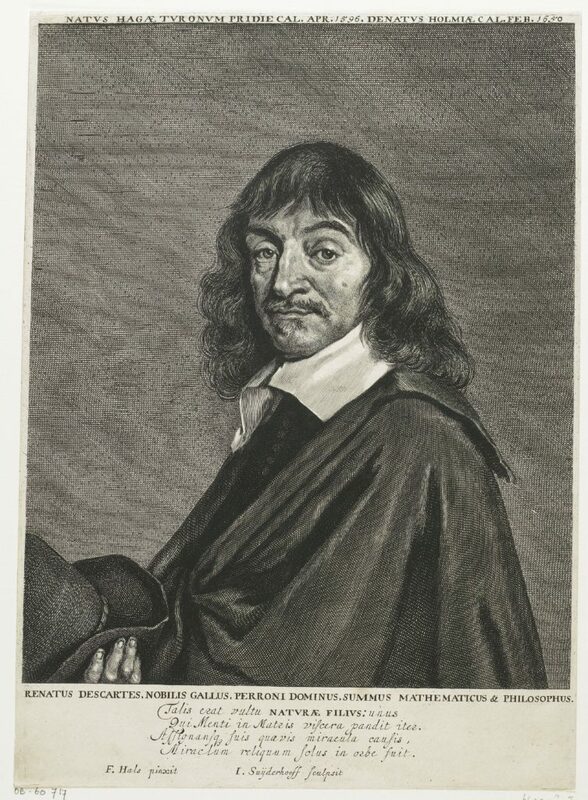 Three others, men who Rembrandt might have known personally, come to mind: the Frenchman René Descartes (1596-1650), the Sephardi Jew Baruch Spinoza (1632-77) and the Moravian Jan Amos Comenius (1592-1670). 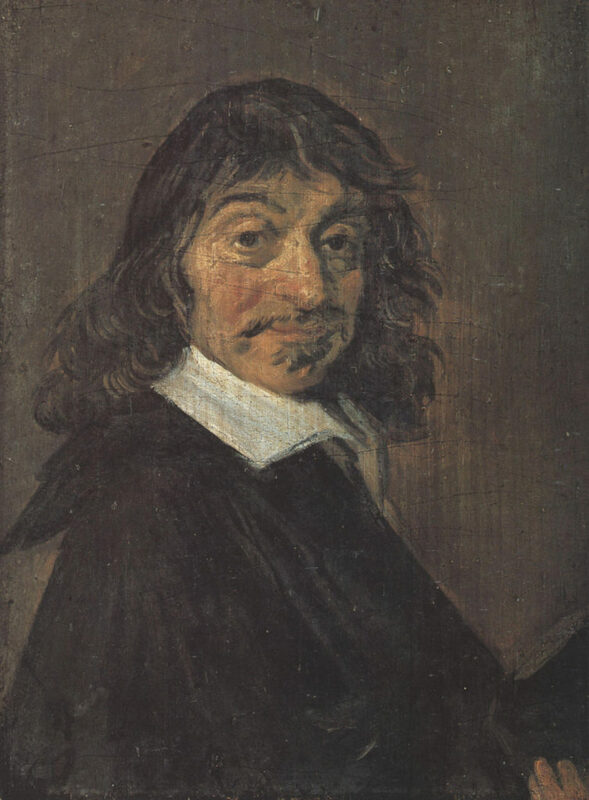 Descartes is often seen as the personification of strict rationality, but this is misleading. He brought all worldly beings and substances into relation with an ominipotent divinity, rejecting the notion that anything can exist independent of the godhead. Creation and its creator, he maintained, were one and indivisible. Spinoza too affirmed that everything in the universe forms a single whole, but his philosophy had no room for a creator. Natural phenomena find their causes in nature itself, he wrote. That all-encompassing nature is coexistent with God, a way of thinking known as pantheism. 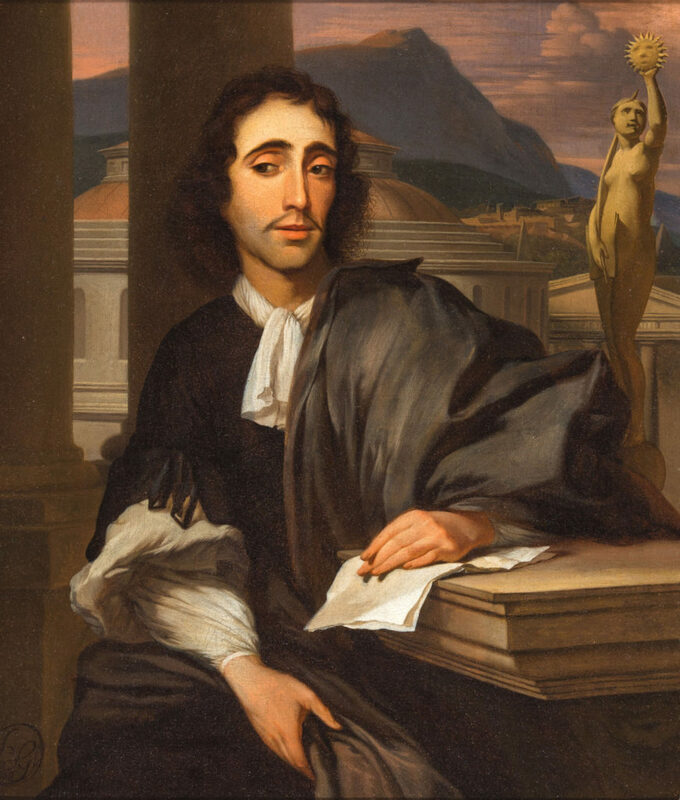 The recently rediscovered (and by some doubted) portrait illustrated provides Spinoza with a statue of Truth. Comenius, acknowledging that mankind may not be able to comprehend God or nature, proposed that we accept wisdom as the guiding principle of our strivings. Not theism or pantheism but pansophism. 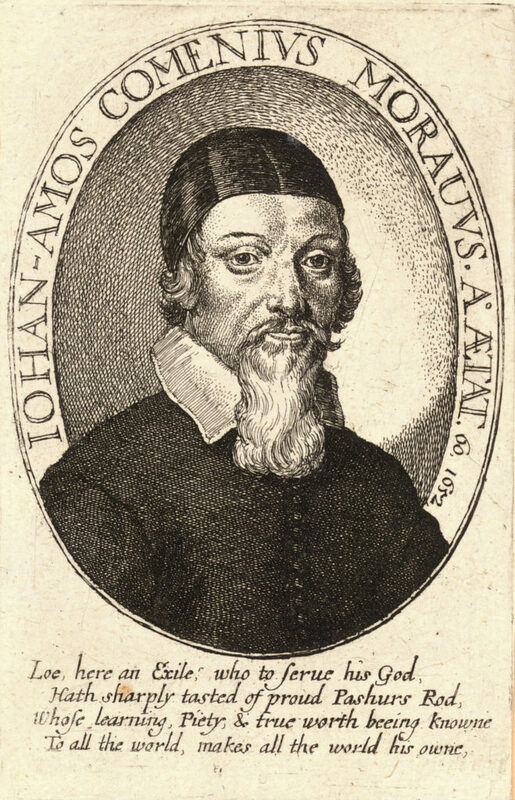 In contrast to Descartes and Spinoza, who wrote only for an intellectual elite, Comenius brought his reconciliation of opposites admirably into practice by pedagogical means, complete with a schoolbook. That he fled his country and found protection in Amsterdam, for a time in this very house, lends resonance to the new function of the House with the Heads. Rembrandt’s coalescence of particulars and universals; Descartes’ bridge between faith and reason; Spinoza’s nature as divinity; Comenius’s instruments for attaining wisdom – these are only four of the countless ways in which people of their century, in (relatively) free Amsterdam engaged in the pursuit of truth. On the shelves of the Ritman library you will find the results of their efforts and those of many others, less well known, often forgotten. It is all too easy to dismiss these mystics and occultists, alchemists and sectarians, as misled, irrelevant souls left behind in a cul-de-sac of the history of ideas. This is a grave mistake. They belong to an age-old strand of the history of mankind that is interwoven with the more canonical movements we like to think of as our forebears. Moreover, however different they were from each other, all shared a commitment – in shining contrast to the orthodoxies of their time – to the free spirit and open mind, the principles that bring us here today. The hunt for truth is not an innocent occupation. Those who undertake it are sure to be mistrusted, misunderstood, misquoted and belittled. They will be censured just as much or more for what they did not say as what they did say. The risk of active persecution is very real. Descartes and Comenius had to leave their homelands to write and publish what they thought. 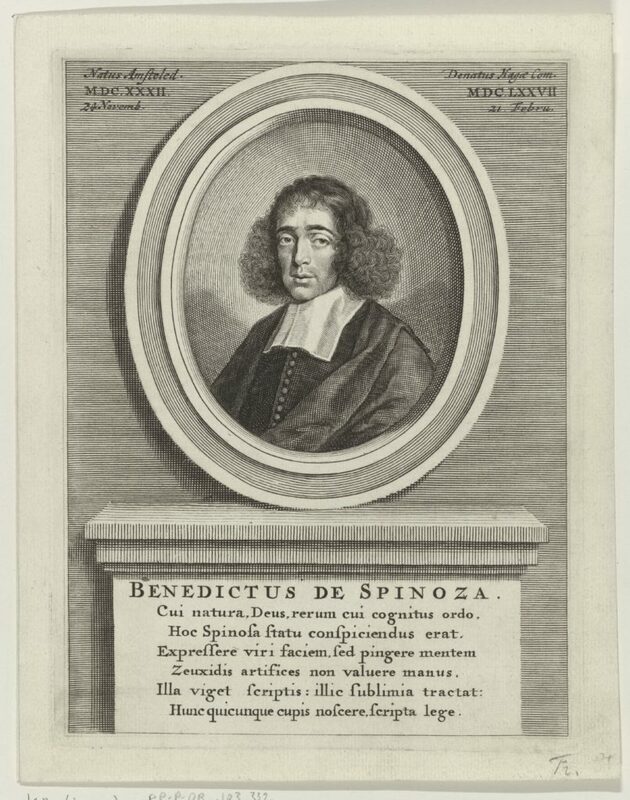 Spinoza was banned from the Jewish community into which he was born on account of the freedoms he permitted himself. Rembrandt was unjustly castigated as “the first heretic in art” and reviled by many for centuries. That we can celebrate the founding of an Embassy of the Free Mind in this House, without fear of persecution, does not speak for itself. I suspect that there still are more countries where a movement to promote free thinking would be suppressed rather than exalted. Even in our own Netherlands, Joost and Rachel Ritman did not reach the proud day of today unscathed. Their tribulations were due in some measure to their persistent love for the truth. There is an old and very attractive theory that a painting by Rembrandt in the Uffizi is a portrait of Comenius. If it is, as may very well be the case, then his spirit too wanders the halls of the House with the Heads, where the sitter once lived. But even without that additional fillip, I feel secure as a Rembrandt researcher and an Ambassador of the Free Mind, in claiming to have Rembrandt on my side. He paid his dues for his choice for freedom and truth, for which we too now choose and add our own payments. © Gary Schwartz 2017. Published on the Schwartzlist 18 August 2017. It isn’t impossible that we have been traveling a bit too much the past few months. After Rome/Naples and Warsaw in May, in June we went back to Italy for a Zürich University symposium on (auto)biography at Villa Vigoni in Menaggio, in mid-July to Kassel for documenta 14 and from 27 July to 11 August to New York, Boston and New Hampshire, with stopovers in Stockholm and Oslo on the way out and back. Reports on these trips will I am afraid have to go on your large pile of uncollectable IOUs with my signature. A query from a reader of the first hour, Ann Sutherland Harris, led me to post a column from 2001 on another conference in Italy I attended, at the Datini Institute for Economic History, and the published text of the paper I gave there. If you are not subscribed to the Schwartzlist and would like to be, drop me a line at Gary Schwartz@xs4all.nl. 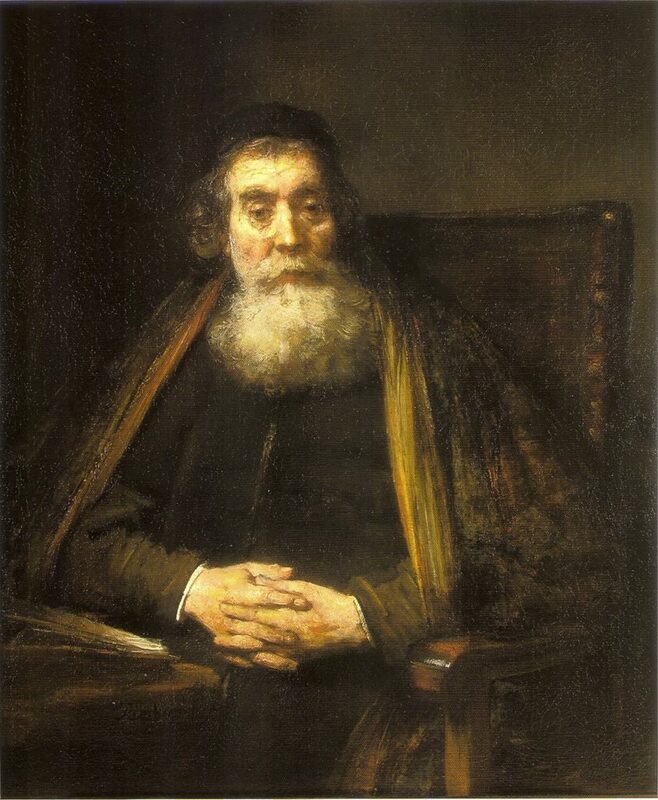 What’s interesting about the Rembrandt portrait of the elderly man (possibly Comenius) is that it has often been claimed (without any evidence or even plausibility whatsoever) to be a portrait of Rabbi Saul Levi Mortera, who was chief rabbi of the Portuguese-Jewish congregation that excommunicated Spinoza.